The first time I described picking blueberries, I wrote, “There’s something peaceful about picking blueberries, even when you have to stand on a ladder to do it.” I went on to post the recipe for a Chocolate-Blueberry Cake that was pretty amazing, but some of the people who commented were more curious about the ladder than the cake. 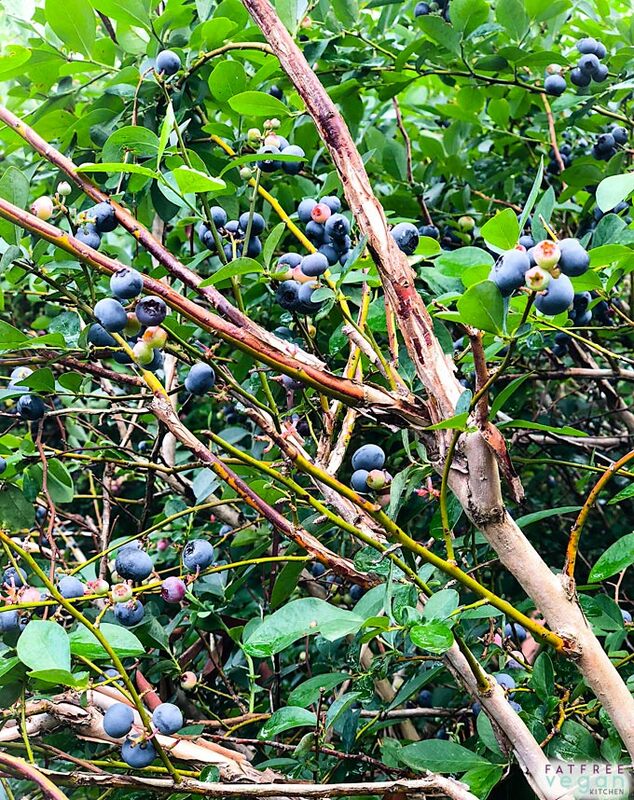 I even received an email informing me that blueberries grow on bushes, not trees, so obviously my story of using a ladder must have been made up. 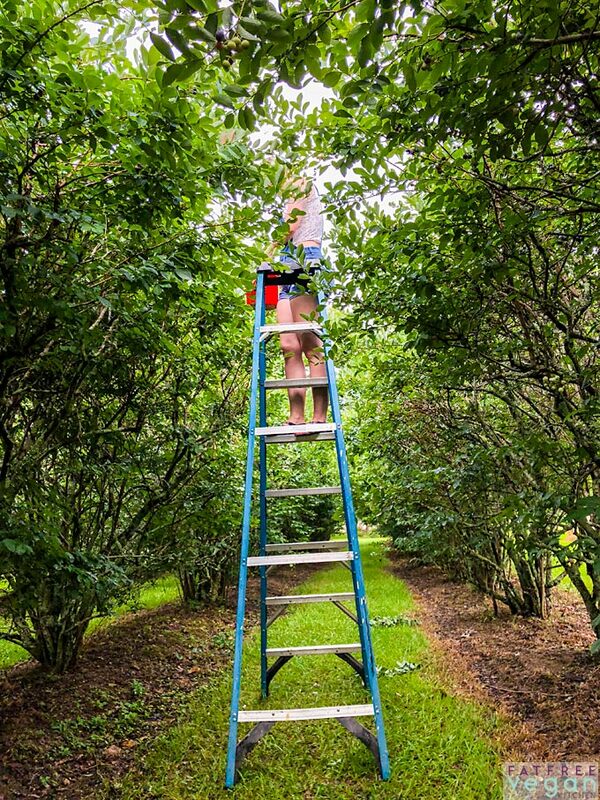 Here’s E, my fairly-tall college student daughter, standing on the 5th rung of a ladder to get to the big blueberries at the top of one of the many bushes at a pick-your-own blueberry farm in Richland, Mississippi. These bushes are so old and large that it can be hard to reach the berries from the ground. I’m afraid of heights, but I managed to convince myself to climb up a rung or two in order to reach these juicy blueberries. Often they were tantalizingly out of reach of my fingers, if not my phone’s camera. The bushes were wet from a thunderstorm the night before, so every time we bumped a branch, we got showered with water. By the time E and I had filled our two gallon buckets, we were soaking wet. But it was worth the heights, the soaked clothes, and the sore muscles to bring home the best blueberries I’ve had in a long time. Then the real work began: washing them, drying them, freezing most of them, and figuring out what to make with the rest of them. I have to admit that E was much better than I was at figuring out what to make with them. While I kept sneaking handfuls out of the fridge to eat plain or with soy yogurt, E was making muffins (twice), pancakes, and even crepes. It seems that baking is her calling. So a few days ago, when she came into the kitchen to bake again, I had a request: Test out this recipe that I just wrote. 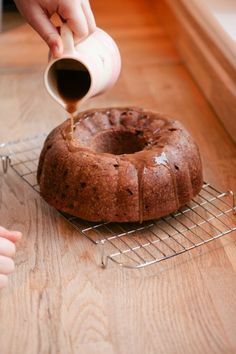 I gave her the recipe, an adaptation of an applesauce cake that I love, and she did the baking. I’m happy to report that we make a good team! 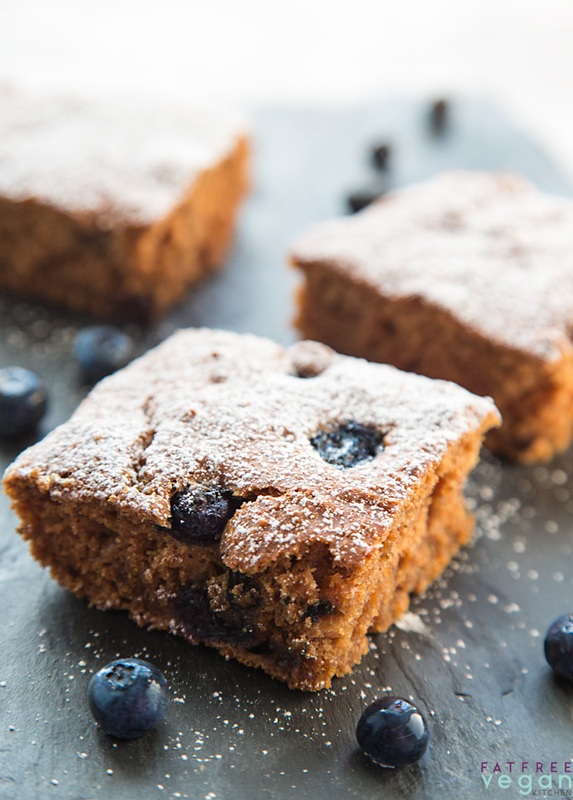 The cake came out dense yet moist, lightly cinnamon-flavored (E admits she may have spilled a little extra cinnamon into the batter when she was measuring), and punctuated with juicy bites of blueberries. 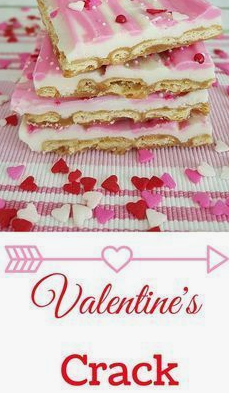 I cut the cake into 12 large “bars” and sprinkled them with confectioners sugar, just to pretty them up, but they were plenty sweet without it. 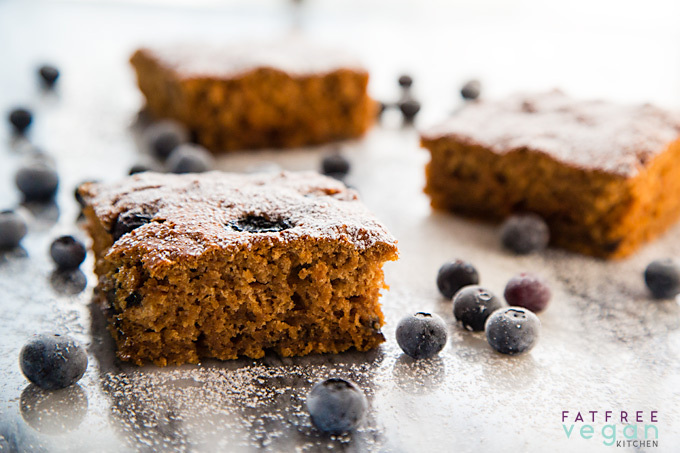 I call these "cake bars" rather than cake because they're not quite as high and fluffy as a traditional cake. But they are moist and flavorful and sturdy enough to wrap up for a treat on the road. Preheat the oven to 325F. Oil or line with parchment paper a 9x13-inch baking dish. 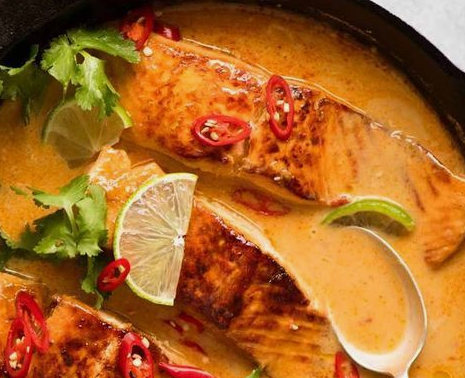 In a large bowl, combine the dry ingredients, mixing well. 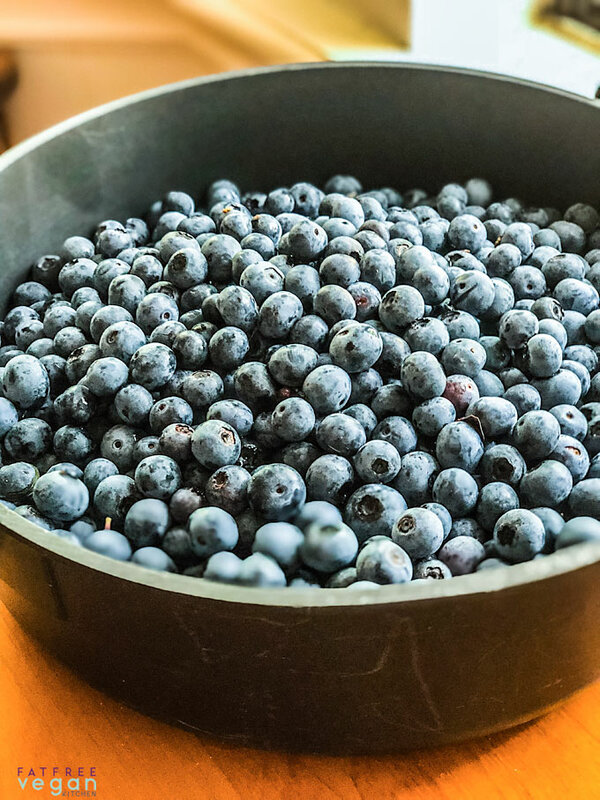 Make a well in the middle and add the applesauce, blueberries, lemon juice, and vanilla. Stir gently, just until the flour is no longer dry. Smooth the batter into the pan and bake until a toothpick inserted in the middle comes out clean, about 40 minutes. Remove from the oven and allow to cool before slicing into 12 pieces and eating. Sprinkle with confectioner's sugar if desired. 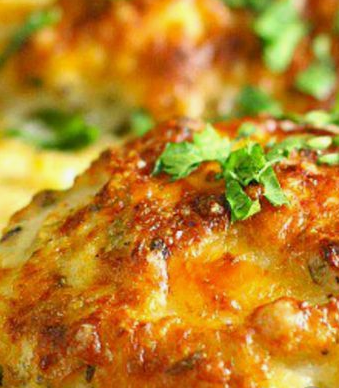 One serving counts as 5 Smart Points on Weight Watchers Freestyle plan. Please try ’em and share ’em! 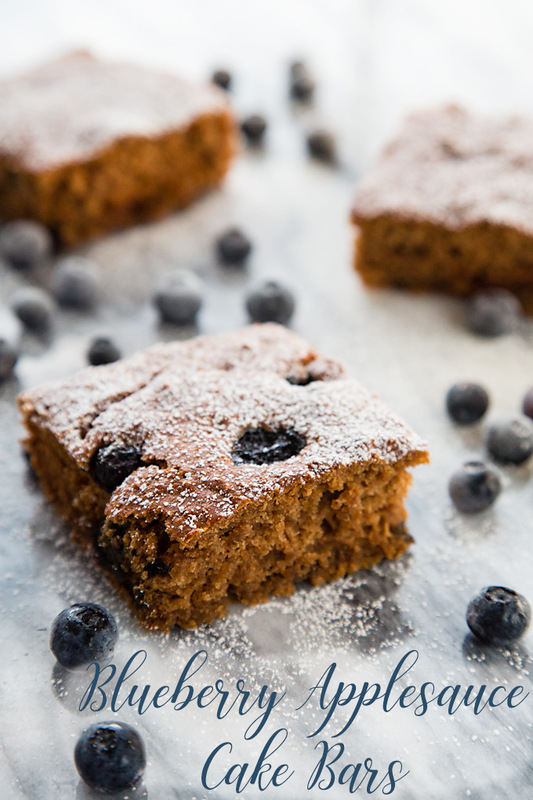 Related Posts of "Blueberry Applesauce Cake Bars | Recipe from FatFree Vegan Kitchen"